Raleigh native Sam Freeze has been captivated by the outdoors for as long as he can remember. Freeze, now a senior in the College of Natural Resources at NC State University, will receive his bachelor’s degree in fisheries, wildlife and conservation biology with a concentration in wildlife science this week. But he’s moved on from snakes and salamanders to bats. “I have no idea how I got interested in them, but I did. So I’m looking to get a master’s degree in wildlife biology doing a project on bats,” he said. A volunteer program that Freeze participated in as a teenager at the North Carolina Museum of Natural Sciences cemented his desire to “do something outdoor related” for the rest of his life. During a visit to the program from Christi Standley of the College of Natural Resources, Freeze learned his interests were included under the umbrella of wildlife biology and that it was an area in which he could earn a degree. “I did some more digging and found out that NC State is one of the premier wildlife and forestry schools in the Southeast, and the rest is history,” he said. In fact, Freeze was so confident that NC State was the right place for him that he did not apply to any other colleges. At NC State, private support in the form of scholarships and awards helped Freeze turn his passion for wildlife into a career. The support was particularly important because Freeze’s specialty — bat conservation and management — is often difficult to study as a student, he said. 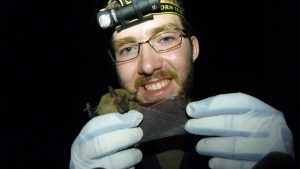 Last year, Freeze received the Thomas L. Quay Wildlife and Natural Resources Experiential Learning Award, which enabled him to take a bat acoustic techniques and analysis course last spring. The privately funded award is named for a late NC State professor who was among the first to earn a doctorate at the university. Without financial support from the Quay Award, Freeze said the course would have been cost prohibitive for a college student. With the course under his belt, Freeze was able to work as a bat research technician last summer in the Obed Wild and Scenic River in Tennessee. 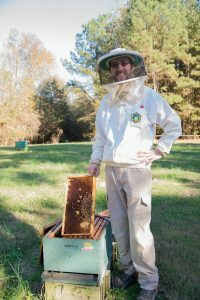 A longtime hobbyist beekeeper, Freeze also has worked for the university’s honey bee research lab since his freshman year. He also has served as president of the Leopold Wildlife Club at NC State. Freeze has benefited from a number of scholarships, including the R.B. and Irene Jordan Endowed Scholarship, the James L. Goodwin Scholarship and the Felton F. Coley Scholarship. He appreciates the philanthropy of alumni and friends who support students like him. After graduation, Freeze will work as a bat biologist for a private consulting firm.